to high light the engravings. Each stone is handcrafted one at a time with utmost care and attention to detail. Any text or image can be added or changed to suit your preference. We love creating custom stones. Call or email us with any ideas you have or just for suggestions on creating that special stone for you. If we don't answer it's because we're working in the studio. Just leave your name and number and we promise you'll hear from us the same day. We put in a lot of effort to making sure you get your stone exactly as you want it and we can send you a proof for approval before any work is started. Many stones can ship the following business day. 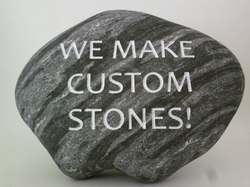 Custom stones and stones personalized with a name ship within two to three weeks. If you need one sooner, contact us and we will do our best to accommodate you. Stones ship free anywhere in the continental USA. We accept all credit cards through Paypal secure checkout (you don't need a Paypal account). We look forward to crafting a stone for you!